A twenty year music career is the dream of many artists of ANY genre. Some artists never make it past a debut album, let alone overcome what is called the "sophomore jinx". Then there is the widely witnessed "artistic identity crisis" that we see when artists attempt to maintain relevance, only to overstay their musical welcome. Let's not forget the occasional public scandal and/or breakup that was the inspiration for that career rejuvenating album that refocuses the artist into the next 2 or 3 hit albums, then establishing the artist as a time-tested veteran, wiser, strong, harder working, legacy-building genius respected by nearly everyone's ear their work touches! But none of that happens in Gospel Music right? 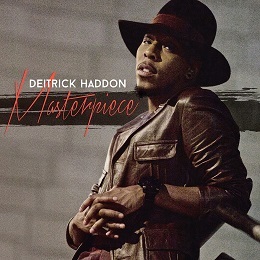 Enter Masterpiece, Deitrick Haddon's 13th (14th if you count LXW) studio effort. A 17-track, well-rounded offering commemorating the next step in Haddon's unfinished life process. Kicking off the album is the title track 'Masterpiece' which sets the tone for the first act of this project, and is a nice recap of life from last album to present, in song form, with heavy bass, and strong urban feel. In fact, the next 2 tracks ("Sinner" and "Running") have the same sonic feel, which might turn an ear or two, but this is to be expected on any Deitrick Haddon album. So before I scare some of the more traditional gospel music listeners away, let me assure you - the tone does shift gears. The album kicks into a lighter, more fun vibe, yet maintaining its message with 'Be Like Jesus' with its sing-along chorus, and hand-clapping groove -classic Deitrick mode. Fans of earlier works will love this one. Continuing with the fun feel is 'Do It for Love', a song that can easily be inserted into any Chicago Steppers playlist. Its coolest element is the talkbox intro, which is becoming popular in modern artistic music (see Christon Gray's 'The Last Time' or Imogen Heap's 'Hide n Seek'), and is a creative piece that allows the song to stand out. An R&B feel is inserted with "Perfect Storm" which talks about God's way of putting you where you need to be, another track that is signature DH. Haddon has not lost his touch, and the sound that made him a household Gospel Music name is still very much present with songs like "Walls are Coming Down", "Testify" and the lead single, "Restore Me Again". Some of the grittier tracks like "The Jesus Anthem" (featuring UK rapper Guvna B) add the Millennial flavor that is needed without excessive "turn up." There are elements of this album may be a turn-off to some, but there are so many good songs that you will allow those elements to grow on you. It reaches the streets and the pews in terms of sound, and the message of redemption, hope, and overcoming are evident throughout every single selection. This is a CD that will keep peace in the car on a family drive due to it's hip hop to church feel, and can soundtrack whatever busy activity you have going. It's a must have for your collection, and just plain good. All content in GOSPELflava © copyright 2015. No information to be reprinted or re-broadcast from this site without the expressed written consent of GOSPELflava.com. All rights reserved.